The white ‘Raw Bloke’, the Aussie bushman, the tough man is a’dying in Australia. At the same time Australia is leading and impacting on global ‘sophisticated society’ in terms of culinary influence such as fusion cooking. In fact – I’d argue stereotypes of Ozzie aren’t enough – the bushman is much more bushman and the urban male much more urban. Why is the ‘pure, white’ bush bloke culture dying? There are a variety of reasons – immigration from Asia, (Australia is more multicultural) rural depopulation and lastly the money is flowing to the town not the country. 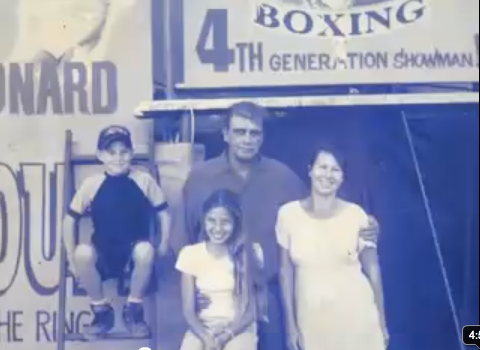 The basic idea is the tent turns up and anyone can challenge a professional fighter. (6-10 fighters tour with the tent) Women box women. it’s not just a man’s game. At Birdsville, NSW (population 150) the annual boxing tent is the highlight of the outback calendar with 1000’s of people flying in for the celebration of beer, boxing and BBQ. As attendees say “It’s the event of the outback year”; others go further “I live for Birdsville”. Recently Fred was awarded the Order of Australia (OAM) for his services to Birdsville and for keeping an icon of Australia alive. So let’s think about this. Food the most basic and key badge of a society – is becoming more sophisticated at the same time as a significant part of the population is fighting for “tucker” survival. Le cru et le cruit are becoming more ‘cruey’ and more ‘cuitey’ a la meme temps. Recently, after I wrote a piece of copy on Corporate Responsibility for a global company, I was asked to take out the word ‘fair’ on the grounds that it was ‘too philanthropic’. I was surprised: don’t ‘fair’ and ‘philanthropic’ mean something quite different? We generally think of ‘fair’ as referring to an abstract system of equality and justice, while philanthropy is more about the subjective, personal feelings of the donor. Perhaps my client put the two concepts together because, however contrasting, they’re both now inimical to the way Corporate Responsibility is heading. While justice and philanthropy may carry different meanings in ethics, they’re equally ‘in excess’ of the corporate world's newly internalised and systematised take on ethics. Broadly speaking, the language of Corporate Responsibility now describes ethics as a direct profit driver, integrating it into core business activities. It's an attempt to 'own' ethics, remedying the way it's previously stuck out like a sore thumb in business symbolism. For example, residually speaking, Corporate Responsibility is about ‘philanthropy’. In practice, that means companies give money to their favourite charities. It’s an add-on: a nice thing to do that’s more or less arbitrary and subjective. It has only a tangential and inessential relationship to business. Dominant symbolism sees a turn from philanthropy to justice. The idea of Fair Trade comes in – casting doubt on old-fashioned ‘charity-giving’ as top-down, patrician and unsustainable. Companies start offering consumers ethical options, based on giving suppliers and workers a fair deal and fair conditions. It sounds good – but ideas of justice and fairness still don't fit. They continue to trouble business by referring to an ethics grounded and legitimised outside the corporation itself. After all, ‘fair’ applies to everyone, everywhere: it’s an idea based on a transcendent, public and shared sense of what’s right and wrong. Just as old-fashioned philanthropy represented something ‘in excess’ of profit (subjective feeling), so does the idea of fairness: it belongs to a public language that’s not reducible to the corporate realm. The emergent term in Corporate Responsibility – ethics as a growth engine – seeks to cut off these uncomfortable ‘sore thumbs’ (philanthropy and fairness) and integrate ethics into the internal symbolic system of business. Now, companies are talking about ethics as the way they’re going to drive growth – not as a nice add-on (philanthropy), or as an incursion of public value systems into their thinking (fairness). From now on, ethics isn’t going to be anything ‘other’ to business: it’s going to be reclaimed as inherent. For an example, we can turn to a concept now in vogue in Corporate Responsibility: ‘Natural Capital’. ‘Natural Capital’ means seeing the planet itself as an asset: we can either tend it carefully so we can live sustainably off its interest, or just erode its capital worth, as we have been doing. The symbolism here also means seeing the earth as a ‘service provider’ which gives companies the air and water they need to do business, just as Apple supplies them with laptops. What’s interesting about the symbolism here is the way it erodes all distinction between ‘ethics’, ‘nature’ and ‘profit’. All terms find themselves reduced to the language of the corporation itself, which can now claim independence from external symbolic systems and values. Print is dead, long live magazines! We all know print is in decline and as a medium it is unsustainable. 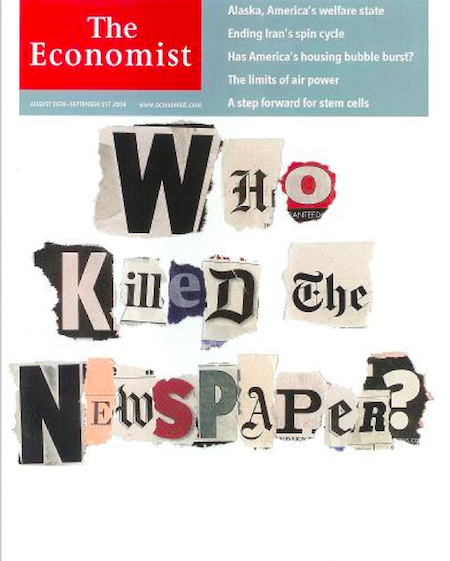 However, these days the business of newspaper publishing comprises print, web and apps, and it is a tale of two trends. Whilst the US and Europe are experiencing a decline, the emerging markets are showing signs of growth with LatAm expecting the largest increase of 4.7% over the next 4 years. The burgeoning free newspaper market is also seeing growth in the Asia Pacific and Latin American regions. But interestingly people do expect to pay for their mobile sources of information and entertainment. Apps like Flipboard aggregate news from multiple publishers where you can build your own ‘news playlists’. Apple has launched Newsstand on the iOS 5 (although typically they retain all the data). The new Facebook apps allow publishers to be exposed to a wider audience via exposure in the Ticker and on your newsfeed; The Guardian app gets over 1 million page views a day from Facebook. With the increase of information sharing editors or curators are being superseded by friends or ‘people like you’. Ever since Esquire launched its Augmented Reality enabled edition 2 years ago, magazines have been looking for different ways to engage their readers on multi platforms by innovating and diversifying their offer. Vice started life 17 years ago as a niche free magazine in Canada and now has over 30 local editions, it runs an international creative agency, an IPTV channel and even a pub! The Reader’s Digest meanwhile makes only 20% out of actual publishing – the rest is from financial & other services. Meanwhile in China, Vogue and local women’s fashion glossy Raili regularly publish editions of 350 pages and have even created TV shows. Contract and niche magazine publishing are thriving. British photographer Rankin has just launched a new bi-annual, Hunger, whilst ‘We Love Pop’ is a new title from Egmont. Even Conde Nast’s Style.com has launched in print and the BBC has just sold all their titles to a Venture Capitalist so business can’t be all bad. Ethan Zuckerman, director of the Centre for Civic Media at MIT, an internet advocate, agrees that the internet doesn’t match the ability of printed media to bring you information you didn’t know you wanted to know. This presents an interesting argument in defence of ‘stumbling across’ the printed page. Ultimately, the media owners who survive will be those who offer a unique service to brands, enabling them reach their discrete communities of loyal readers. With insights into their readers, publishers and brands can partner to co-create impactful content with the resources of editorial and in-house creative teams. In the previous article on Hermes, starting with cultural origins in ancient times, I took note of the figure of the deity as a channel of communication and as a message. Here I want to focus on more recent times and ‘culture capital’ – specifically how marketing and advertising scoop up ready-to-use forms from history and universally recognised traditions as well as from local legends and myths in order to connect stories and symbols with their products (goods/services) and in such a way as to grab the attention of the potential consumers. This is clear demonstration of a principle, defined by Russian semiologist Yuri Lotman, who maintains that ‘old texts’, which circulate in culture, are there to be appropriated in terms of what exists on the surface and then refreshed by means of new codes. In the case of Hermes, on the basis of some limited research (which we invite Semionaut readers to supplement) on uses of the name and figure in modern trade and advertising, it appears that in the mass consciousness in the most cases the deity remains the one who rapidly delivers messages and objects from one point to another. His most usual physical attribute – the wings (whether on his hat or sandals) is the most exploited symbol, preferred among the shipping and logistic companies. In Bulgaria we note a small difference, maybe because we here are close to the Hermes’s area of origin and operation, in that we see his attributes and name incorporated into tourist agencies and one well-known publishing house. Obviously for the locals the deity also has meaning of transfer. But there are some curious exceptions, for example the use of the caduceus (Hermes’s sceptre) and serpents in logos as a reference to the medicinal skills of the Greek god. There is also one case from the not too distant past where a famous typewriter brand was named ‘Hermes’, clearly alluding to the god’s connection model with the invention of writing. Like the use of his name of publishing house this has a connection with transfer of knowledge and wisdom by means of some kind of medium – language and books. In a sense, time is a medium as well and as we saw in the earlier piece, time and space are mixed together when Hermes does what he does – moreover, he is among the immortals and his actions are set in the mythologically timeless. In contrast with all these relatively easily decodable meaning, among the richest and most eloquent examples for the use of this mythologeme in its full brilliance remains the name of the French luxury Hermès. This company was established in 1837 by Thierry Hermés and is today one of the major players in the fashion and luxury business alongside such brands as Gucci and Louis Vuitton. The Hermès offer includes perfumes, jewelry and various accessories but the main products which bring the fame of the company are bags and sandals. 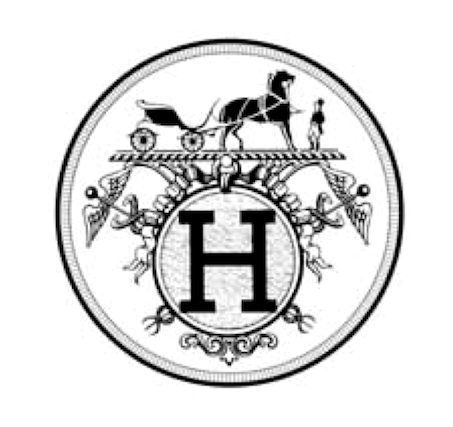 As we might presume, the brand;’s communication deliberately emphasizes the connection between these products and the deeds of Hermes as messenger wearing winged sandals, one of whose main attributes is a bag. From this point we could decide that the company does not count only on the coincidence in the names of its founder and the one of the Greek deity. Moreover, in the creation of the visual identity (predominantly in its logo) Hermès has always been prepared to access tangentially other symbolic accoutrements of the deity. A historical execution of the logo (above), for example, puts the main element – a cab with one horse in front of it – above two images of the caduceus (placed on the left and on the right side, with wings and interlaced serpents added). In this way we have an opportunity to observe the mythology in action – in new context but with the message adapted to the perceptions of a contemporary consumer audience. We would love to hear comments below about any other variations on this broader theme of how Hermes symbolism has been and is deployed by brands. Our understanding of innovation and creativity is accelerating in this age of technology and openness. And from a corporate point of view, there is a thirst for answers … what is the “magic formula” of creativity in business? How do we innovate to maximize profit and competitive potential? How do we do so faster and faster? What is the right management model for innovation? How do we stay true to brand while being open to outside ideas and influences (which have been clearly demonstrated as critical triggers to new ways of thinking and doing)? Does great innovation come from play or science? And how significant are the “ways of being” of each of these two brands on talent recruitment? Lohr suggests that invariably, these two different creative archetypes will begin to converge and adapt. The question is, where will it go? You are currently browsing the Semionaut blog archives for February, 2012.